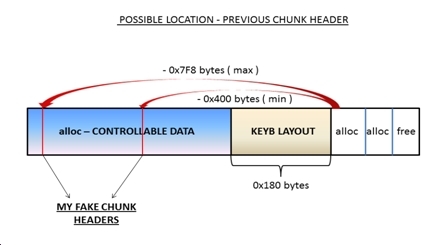 In this post, I'm going to share a deeply technical explanation regarding the challenging work involved in exploiting a Windows-based vulnerability I discovered (CVE-2012-0181) and how it was exploited within Windows 2003, Windows Vista and Windows 2008. Although this is a first-time publication of these findings, you might be interested to know that the attack vector was the same used by the infamous Stuxnet worm to exploit a bug (MS10-073 and CVE-2010-2743). When the syscall is wrapped by 'LoadKeyboardLayout', these parameters are set before entering into kernel mode. In particular, the handle to a "keyboard layout file" is set when the 'pwszKLID' parameter passed to 'LoadKeyboardLayout' is converted to string with the name of a keyboard layout file (generally 'kbdXX.dll'), and then this file is opened. The index argument is an offset into the keyboard layout DLL passed as a handle. One can ask what would happen if the 'NtUserLoadKeyboardLayoutEx' function (the syscall) is called by us instead of calling it through 'LoadKeyboardLayout'? We could then pass the handle we want and the index value we want... but does this have any security implications? In general, the keyboard layout files are DLLs that export only one function ('KbdLayerDescriptor') and which are located in the "windows\system32" directory. On the other hand, index is a pointer relative to the DLL’s base and it is used to refresh a pointer table ('LayerDescriptor') located in the kernel’s .DATA section. After the release of XP, Microsoft introduced some changes in how the syscall operates. - The file location parameter (handle) isn't checked (e.g., this means we can pass a file of our design, and in particular, a rootkit). - The index into the file isn't checked (e.g., this means we can pass an index out of the range used by the file mapped in kernel memory where it is easier to write attacker-generated code). The rest of the OSes: - The file location parameter (handle) is checked (i.e., it must be located in "windows\system32"). 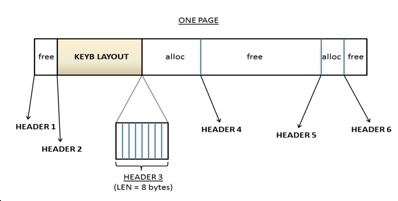 - The index into the file is checked (i.e., it must be in the bound of the kernel memory mapped at the .DATA section). Hence, exploitation for XP becomes easier. Next, we’ll explain how to treat the latter cases. 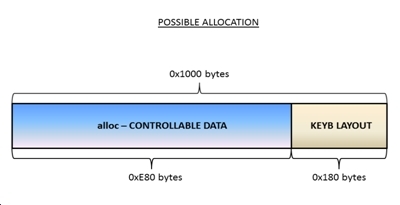 Namely: how can we take advantage of this syscall in the cases of non-XP operating systems with the above restrictions? If this pointer is in the bounds of the keyboard layout, the "PE loader" continues with the same process, until the table is refreshed (12 or 13 pointers). If this pointer is out of the bounds, the function 'ReadLayoutFile' deallocates the keyboard layout and returns ERROR. 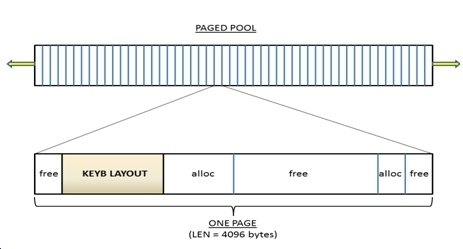 Since we control index, the range checked is insufficient, so the bug could be used to overwrite one, two or three bytes out of the memory allocated by windows. This kind of bug is called an off-by-one bug, or more generically: memory corruption. The field previous, holds an "unsigned short" variable (16 bits). To obtain the chunk header previous to itself, one needs to multiply this number times 8. The field next, holds an "unsigned short" variable (16 bits). To obtain the chunk header after itself, one needs to multiply this number times 8. 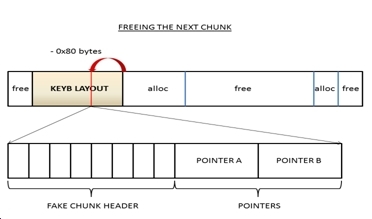 We note that actually only 9 bits are used to represent the chunk size, the remaining 7 bits are used as an index which determines the block which they belong to. Here, the red arrow represents what the bug allows us to overwrite. 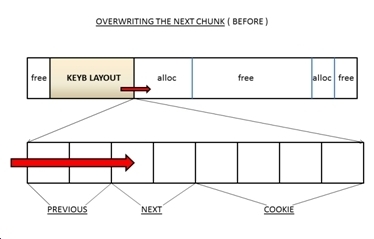 If the keyboard layout chunk is deallocated (calling 'ExFreePoolWithTag' function), the Windows kernel produces a blue screen of death (BSoD) because the check that compares the size of the keyboard layout chunk, computed from the next field header in the keyboard layout chunk, with the value of the previous field header in the next chunk will fail and thus produce the blue screen. 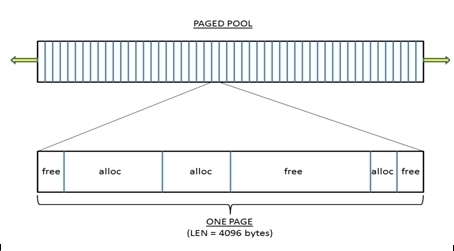 If the next chunk (one of the alloc chunks in Figure 8 ) is deallocated, a very interesting effect takes place: The 'ExFreePoolWithTag' function reads the previous field (that we have already overwritten) and obtains the chunk header of our choice. This effect is known as heap coalesce. So, if we controlled the memory area content where the fake header is read, we could control the value of these 2 pointers (A and B). We can break the exploitation problem in the following three sub-problems. First: When deallocation happens, we need to avoid the keyboard layout chunk so that the next chunk is deallocated. The former situation would lead to a BSoD and end our hope for getting the exploit to work. So we need to somehow provoke for the next chunk to be deallocated. 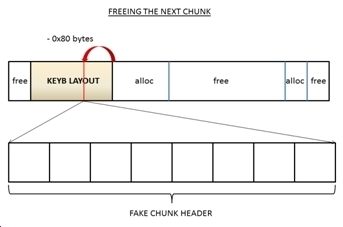 Second: After doing the off-by-one, we do not know the value of the first byte in the NEXT chunk header. We need to estimate this value so that we know where it will point. Third: We don't control the (keyboard layout) DLL content, so where will we write our payload? The implication of this is that we can't create a fake chunk header pointing into the DLL area, because this file is not writable. Hence, exploitation will have to go through some other means. 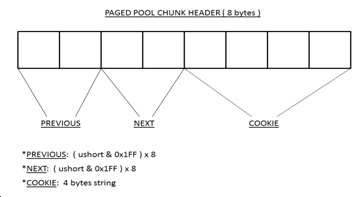 On the other hand, we might be able to find, somewhere in the .DATA area, data consistent with a chunk header followed by two pointers and then have the byte used to overwrite the next chunk header to point to this (fake) chunk header. To solve problem 3 note that we needn't overwrite the DLL content, because if it is sufficient to find a DLL with a .DATA section located less than 0x400 bytes away. This is because the minimum byte value used to overwrite the next chunk is 0x80 (128 decimal), and 0x80 times 8 is 0x400 (1024 decimal). So that when the 'ExFreePoolWithTag' function finds the fake chunk header, it would be out of the keyboard layout chunk. 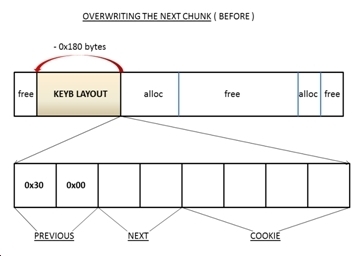 If this happens, the overwritten next chunk header is allocated in the next memory page (next 4 kB). As a result, we can use POINTER 1 and POINTER 2 to overwrite a memory address with a specific value. Once a specific memory address was written, there are many ways to take control of the Windows kernel, for example, by overwriting the Service Description Table (SDT) table. That may be known by many, and for the rest, it is a story for some other time. I used this same technique to write the local exploit for MS11-077 (CVE-2011-2003) and the local exploit for the bug used by MS11-087 (the infamous Duqu bug, with CVE-2011-3402). It is worth noting that this technique will not work in Windows 7 because some additional checks will make the heap coalesce technique fail.